While scrolling through the interwebs today I bumped into this tweet from Architectural Digest highlighting 20 cute items from Walmart. Okay, that I had to see. And I have to agree — there are lots of really “super cute things” that I had not noticed while shopping for cheap soap dispensers. But the item that caught my eye and sent me off to color dreamland was a gorgeous ribbed glass bowl in the most deliciously subtle tones of green. It reminded me of the Farrow & Ball color palette — you know — those paint colors that look like velvet in shades and tones that no other paint company seems to match. There’s something about them (trade secrets, I suspect) that gives a room or a piece of furniture a hue that whispers sophistication. Not one of them will show up in a Crayola box. There are two obvious things that distinguish Farrow & Ball from other more mainstream paint lines: the number of colors (way fewer) and the price (way more). And although many home projects and palettes of colors might not be worth the extra expense because the subtle tonal difference or undertone might not be noticed, I find that the blues and greens in Farrow & Ball are far superior for their soft, sophisticated richness. Maybe it’s the largess of their English roots (Farrow & Ball is located in the United Kingdom). Or maybe it’s the fewer number of perfect colors (only 132) so that every color decision is a successful one. Or the fact that the company has maintained its original formulation. Or maybe it’s the mystique. But whatever it is … I love it. Regardless of the paint line you prefer, keep your eyes open for color inspirations. They are everywhere — even Walmart. Create flow throughout your home by sharing colors between rooms. In this luscious red Venetian plaster dining room, the red is shared with the living room pillows across the hall. Just enough to draw your eye over there and pull the two spaces together. Paint colors in nearby rooms “speak” to each other because they are adjacent on the color wheel. 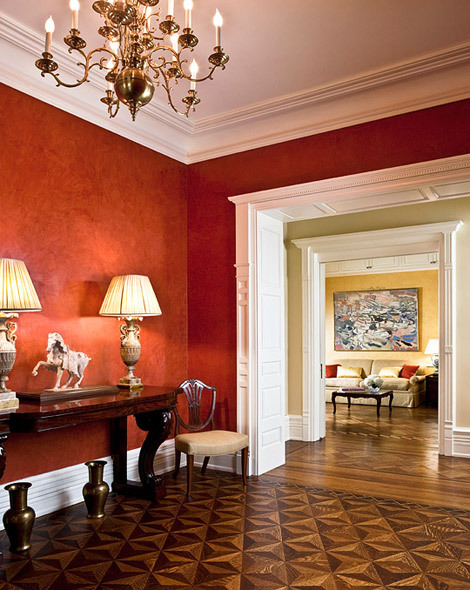 Red and yellow are separated by a neutral with a slight green undertone, adding a punch of contrast to the hallway. Layering colors between rooms that you can see from one location and “cross-pollinating” the colors with pillows, accessories, and artwork will create a flow that will make your home appear bigger, less chopped-up, and more thoughtfully planned for optimal warmth. If you own a cottage or rent one somewhere, you know what the cottage style is all about: old painted furniture, vintage fabrics, mixes of woods and different styles of furniture. It’s all about care-free and comfortable living because that’s what vacations are for. To bring that feeling and more importantly the lifestyle home with you, all you need is a relaxed attitude about your furnishings. Instead of upholstered furniture that warrants surveillance when your children and their friends are around (say nothing of the pets), just invest in some washable custom slipcovers. White is actually best since you can always bleach out the jelly stains if necessary. Cover the expensive sofa and chairs and just feel your blood pressure lowering. You’re relaxing already. And who says wicker is just for porches. A good coat of spray paint will freshen up even the most weather-beaten wicker and make it presentable for your living room. If you haven’t inherited a cellar full of old furniture that would be perfect for your new relaxed cottage look, then let the furniture hunt begin. Plan what you need, of course, to avoid coming home with impulse purchases, but start the search for the perfect old coffee table, end table, console, buffet, china hutch, whatever you need to create your cottage lifestyle. Visit consignment stores, yard sales, thrift shops, and flea markets. The point is: If you like the piece and it fits, then buy it. If it fits and you don’t like the look, buy it anyway and paint it. Cottages are typically dumping grounds for old furniture that’s replaced in the permanent home. And to make the furniture look better, it’s often painted. 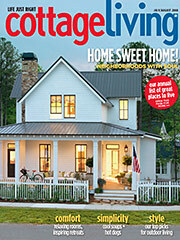 Time and wear rough up the edges on these cottage relics, but you can recreate the look with paint and some sandpaper. You don’t want things to match. Furniture and other items are acquired over time, sometimes decades, so if the piece has a function, it works. The best part about the cottage style is how comfortable your guests will be when they visit you. No pretense. No uncomfortable questions about where to sit. Your home will feel warm and inviting to everyone. You are currently browsing entries tagged with interiors at Your Home & Color Coach.